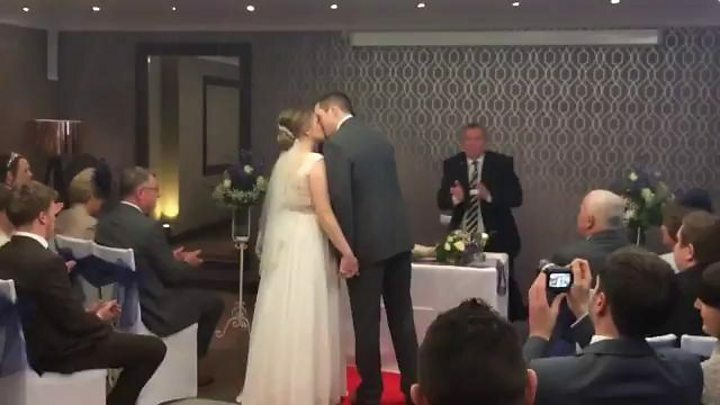 A groom almost missed his wedding after he got snowed in. Ms Metcalf had joked that "everyone dreams of a white wedding but not necessarily the one I'm going to get." After Mr Enright senior called BBC Radio Lincolnshire about the family's plight, Lincoln Audi got in touch and offered to send a vehicle to transport the party, as well as the wedding cake and flowers. They arrived at the venue on time - with about an hour to spare. Mr Enright said the last-minute help had been "an amazing gesture". "I thought I was going to be stranded there," he said. About 70 guests had been invited to the wedding service - but at least 20 people cancelled because of the weather. Earlier, the groom, who had dreamt of a spring wedding, said: "It feels a bit nervy but we hope to make it through." "I've said 'wait for me at the hotel'." "Ask me and Gina if we are laughing about it in a year's time", he added.